On April 2nd you can dine-to-donate at Patrick’s Pub! 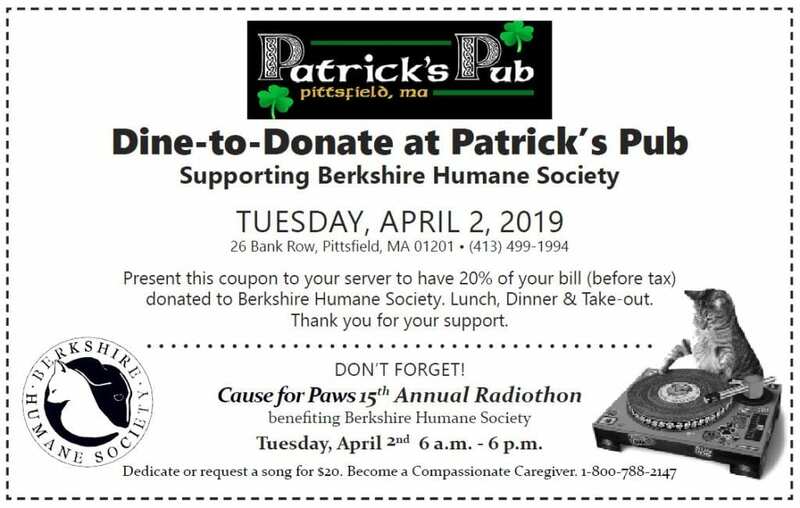 Put your food to work helping homeless animals by presenting the below coupon to your server to have 20% of your bill (before tax) donated to Berkshire Humane Society. Lunch, dinner and take-out too! This is also the date of our 15th annual Cause for Paws Radiothon…don’t forget to call in to request or dedicate a song for $20. We’re also looking to sign people up as members and Compassionate Caregivers. 6 a.m. – 6 p.m. 1-800-788-2147. Learn more here. The below coupon can be printed and presented in person, or shown on your phone. Thank you for your support!